ground so situated that they have a wide view of the surrounding countryside. of good sized sticks, roots seaweed, bits of turf, vine or plant stalks and lined with roots or grass. 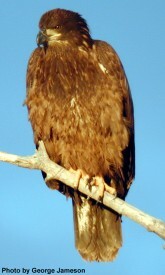 Year after year the same pair of Eagles occupy the nest, making slight repairs to it each spring. 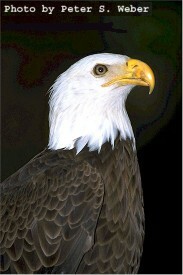 The eggs are incubated for about thirty days and the eagle raise only one brood a season. plumage before they fly. 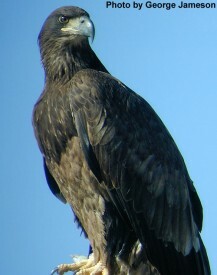 Bald Eagles mate for life and apparently they are very fond of each other.